Overview: Make your own metropolitan utopia! Stores, mansions, towers--anything goes! Overview: From ganja to glory - get ready to grow your operation into a mighty Hempire! This is the ultimate weed growing game. It doesn’t just stop at the pot: you must harvest your plants, breed new and unusual strains, make friends (and enemies), and eventually take control of your entire home city to be victorious. But watch your back! Just ‘cause weed’s gone legit doesn’t mean you’re safe! Hempire is a story driven joint, so get ready to deal with corrupt cops and shady businessmen, while also helping old ladies bake brownies. For real. * Grow popular cannabis strains starting from the classics like Northern lights and Chemdawg. * Use the lab to breed and discover new strains and remain at the top of the industry. * Craft extracts like hash and shatter, and edibles like cookies and brownies. * Customize your grow op with new equipment, lights, and generators as your business grows. * Complete deals with game characters to unlock new features and strains. * Generate huge cash by selling your product in the dispensary. * Invest your money in local businesses and real estate and develop your city. * Start with one bud and grow your business, your Hempire, into a billion dollar enterprise. * Multiplayer Competition. The Hempire Cup: Compete against other players to breed the highest quality strain winning trophies in the Hempire Cup. Grow your Hempire. Your pot-ential is limitless. Please note Hempire is a free-to-play experience, download and play, but some game items are available for purchase using real money. A network connection is also required. Overview: The Bloons are back and better than ever! Get ready for a massive 3D tower defense game designed to give you hours and hours of the best strategy gaming available. * 19 powerful monkey towers, including 2 all new monkeys - Druid and Alchemist! * Play anywhere - single player offline works even when your wifi doesn't! * New Bloons - tricky new bloon types like Purple, Fortified, and the relentless B.A.D. And there's heaps more! We packed as much content and polish into this game as possible, and we'll continue to add new features, content, and challenges in regular updates. We truly respect your time and support, and we hope Bloons TD 6 will be the best strategy game you've ever played. If it's not, please contact us at [email protected] and tell us what we can do better! Now those bloons aren't going to pop themselves... sharpen your darts and go play Bloons TD 6! Bloons TD 6 contains in-game items that can be purchased with real money. You can disable in-app purchases in your device's settings, or reach us at [email protected] for help. Your purchases fund our development updates and new games, and we sincerely appreciate every vote of confidence you give us with your purchases. Overview: Operate Now: Hospital, is a drama inspired medical journey, where you experience being a surgeon, building a medical team, and managing a hospital. In this realistic simulation game, your objective is to assemble a highly skilled medical team to perform operations on patients and to put your medical facility at the number one spot in the world. Scrubs and gloves at the ready! Be prepared for emergency situations where you have little time to save lives! Make crucial decisions, carry out complex surgeries and all kinds of other medical procedures on your patients. As you progress through the game, flashbacks start to appear that glimpse into your patients’ lives and reminisce about moments of your medical career. You are accompanied throughout your medical journey by loyal allies who help you achieve your objectives. There will be moments where you encounter difficult situations but a good surgeon never gives up. Prove your worth and improve the hospital’s reputation. Have you got what it takes to become the world’s best surgeon and hospital manager? Various bug fixes and performance optimizations. Overview: Get on the board of the city multispeciality hospital and medical centre and become a hospital tycoon! We want to welcome the new health care manager of this hospital simulator: YOU! Plan, manage and coordinate our hospital staff and turn yourself into a professional manager and the star doctor of this clinic! Our hospital doors are always open. No matter the time, the emergency room of any health care clinic needs to be prepared for anything, this is a real hospital simulation game!. Become the best manager by looking after different kinds of ill patients with the best doctors and nurses and manage the finances of the health care departments: Provide life-saving care, hire staff, invest in complex medical equipment and manage business issues and health compliances to assure the quality of the service: This is a real medical management simulation! Your decisions will affect the entire health care system! Sew your patients as a genuine surgeon expert in hearts medicine. They may need one or two point of your funny stiching. Cure a dream walker in this hospital simulator, become the owner of your medical centre and manage to master all the free hospital games! - Earn good reputation planning your strategy and healing your ill patients with the best staff and medical equipment. Build medical care rooms with doctors and nurses to provide ill patients with best treatment and medicine in this game hospital. Manage and hire handymen staff to keep the facility clean. Design your health center with strategy to make it bigger and make it the best hospital ever! Put yourself in a position of a real manager. Think like you are not playing doctor games but running a real hospital staff and management problems. Hire the best doctors, nurses, meds and medical equipment so they can cure patients in pain, diagnose a pregnancy, heal injuries or strong fever or even research new heart medication. After the diagnostic tests, a nurse will heal the patient's disease with pills and medicine. Build advanced medical tools, xray equipment and emergency rooms in your health center to provide sick people with a complete medical health care facility. Hire nice doctors, surgeons and nurses to comfort people during their stay and send out your ambulance for emergencies. The theme hospital caring and healing simulation will surely appeal to the ones searching nursing, doctor and hospital games! Compete with other theme hospitals in your city and achieve the best hospital on the simulation games of nurse games!. Plan your strategy and earn the highest reputation as a manager by building the most efficient, beautiful and pleasant health center in the city! Overview: If you enjoy clicker & digging games, Idle Planet Miner is perfect for you! Idle Planet Miner is an incremental, digging, idle clicker game that lets you take control of a mining ship and dig deep into the cores of planets across the solar system! Just start clicking to mine rare metals. Hire special mining managers, dig deep, sell ore, craft alloys, and more! Upgrade your Mining Ship and planets to increase your profits, dig up valuable riches and expand your empire across the stars. Digging for ore has never been more exciting! Tap to dig, then upgrade your ship & planets and hire mangers to help you dig deeper, faster. Unlock a new crafting recipes, new planets and more! Craft an Empire that will span the stars! Download now and start digging for ore in one of the most addicting incremental idle clicker games! Dig your way through the stars! ● Idle to increase your mining rate! ● Tap to smash asteroids and earn rare ore! ● Mine: Earn coins and hire managers! ● Create an Empire Across the stars! ● Hire managers to improve your output! ● Evolve your digging strategy! Unlock special projects to improve your output! ● Play the Market: respond to supply & demand across the galaxy to maximize profits! ● Research special projects and profit! ● Rewards to permanently upgrade your mining ship are everywhere! Idle Planet Miner is the perfect incremental clicker / idle game for fans of endless fun. Idle the day away digging for ore, rare metals, coins, and more! Idle Planet Miner - Dig your way through the stars! discovery in an unknown but beautiful world! the gods. Lead them to great prosperity! that feels real and alive! life on your tablet and smartphone. - And, you can also train your own dino!" Overview: Egypt: Old Kingdom is now available on Google Play! Discover the history of Ancient Egypt in all its glory! Challenge your strategical abilities while learning a lot of history! Build and develop Memphis, the ancient capital of Egypt. Provide enough resources for your city, deal with friendly and hostile neighbors, broaden your state, send expeditions to faraway lands, and build the Great Pyramids! The mighty Gods of Egypt are watching and guiding your every step, so remember to show them your respect and gratitude, and they will lead your Old Kingdom to prosperity! *Doesn't require an online connection to play! *Includes all of the campaigns and modes of the PC version! You are one of the multitudes of incarnations of the great Horus, and side by side with the pharaohs, you are fighting against the mighty Seth, who unleashes numerous disasters upon the lands of Ancient Egypt. Win wars and overcome crises, discover new technologies, worship your gods and conquer neighboring tribes! Are you wise enough to help the ancient kings to unify Lower and Upper Egypt, build a stable economy and to erect the Great Pyramids? You will find yourself in Memphis, 3500-2140 years B.C., the time of the first six dynasties of pharaohs. You will unify the country and create a prosperous kingdom, which later will have to face the havoc of the First Intermediate Period. You will lead the construction of pyramids, choose their design and materials. This process requires tremendous investments, but it is the only way to keep peace and order in the country. You will not only deal with the problems of farmers and craftsmen but also make important political decisions, which will define the future of the kingdom. Numerous challenges and events of different scale await you. Discover the world of the Old Kingdom: exploit new lands, send expeditions to different places, and meet different cultures. Use every opportunity to learn about your surroundings and to expand Egypt's borders. Overview: Create a brighter future…underground! Select from a variety of modern-day rooms to turn an excavation beneath 2,000 feet of bedrock into the very picture of Vault Life. Vault-Tec’s officially scheduled Easter celebrations are back! • Play the limited time Springtime for Atom questline! • Will you work with or against the Children of Atom? Why not both? • Get Cocoa Bean the Legendary Pet. She’ll put a spring in your step! All Resources Increased Instead Of Decrease. 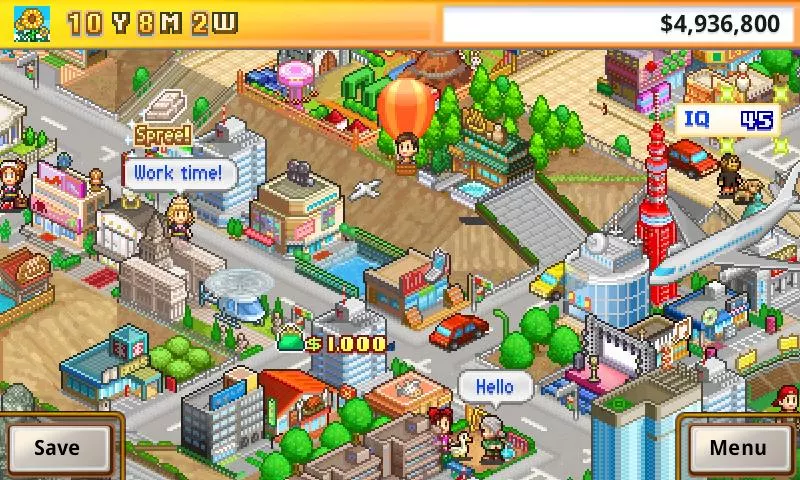 Overview: King of Defense: Battle Frontier is a special tower defense game. The combination of turrets improves the tactics for the player. In this game, players can stack the turrets together to create the best strategy for the level. Overview: Ever wanted to know what it feels like to run your own Pizza shop? Now you can with TapBlaze’s newest game, Good Pizza, Great Pizza! Do your best to fulfill pizza orders from customers while making enough money to keep your shop open. Upgrade your shop with new toppings and equipment to compete against your pizza rival, Alicante! * Featuring Pizza News Network (PNN), the first newscast about all things pizza. * Over 50 customers with unique pizza orders and personalities. * Pizza toppings including pepperoni, sausage, onions, and more. * Equipment upgrades to help you become the master ovenist. * Simple, fun and challenging gameplay. * Created by pizza making professionals; the game designer worked in a pizza kitchen for four years! Can you become the master ovenist? Only time and your pizza skills will tell! Finally, Polish language support is here! Touch to speed up dialog texts. Now oven booster ads show right before oiling the oven. Overview: Welcome to the most exciting and realistic ship simulator game - Ship Sim 2019! Sail around the Mediterranean sea as the captain of a 400 meter oil tanker, a gigantic cargo ship or a luxurious cruise ship. Navigate your ship in a realistic and detailed open world map and complete missions in many of the iconic port cities around the Mediterranean. - new cruise ship available! Overview: Build your own city as the new mayor. Create residential, commercial, and industrial zones. Build parks and recreation spots. Respond to crime and disasters. Watch your city come alive! Take total control of every action on the pitch in a way that only the Pro Evolution Soccer franchise can provide! Scout and Recruit thousands of Football Stars from the best teams in Europe, South America and Asia. Prepare to feel what it takes to play with or against Stars like Lionel Messi, Neymar, Luis Suarez, Andres Iniesta, and Gerard Pique. Acquire players through Scouts, Agents or the Scout Auction. Every player is unique and every match is a new experience! THE OFFICIAL "UEFA CHAMPIONS LEAGUE"! Experience official visuals from the "UEFA Champions League" as you compete against the top teams in Europe. PLAY VS IN REALTIME PVP! Challenge Friends in "Local Match" or discover new rivals in "Online Match" mode. PES 2017 mobile now lets you play PES on-the-go, anytime and anywhere. Controller actions have been optimized to make playing on your phone feel as smooth and exciting as a PES action game should! If you select Japanese in the language settings of the game application, [Winning Eleven 2017] will be displayed. If you select other than Japanese, [PES2017 -PRO EVOLUTION SOCCER-] will be displayed. This game application is a free to play but note that you can purchase paid items additionally. A number of issues were fixed. * Check out the News section in-game for more information. Overview: Escape to an island getaway filled with adventure, mystery, and fun new mini games in this colorful free-to-play game from the makers of FarmVille, the number one farming franchise! Escape to an island getaway filled with adventure, mystery, and fun new mini games in this colorful free-to-play game from the makers of FarmVille, the number one farming franchise! Build your very own beachside inn complete with island workshops, tropical crops, and exotic animals. Farm island fruits like pineapples, coconuts, and mangos to delight your guests. Craft delicious recipes and rare goods like piña coladas, grilled fish, and flower leis. Catch fish with Capri the dolphin and explore with Odney the playful monkey! Feed tasty treats to the cute, playful animals on your island to get unique photo ops for your guests. Story-based quests help you explore uncharted areas, learn more about your island and find rare items and goods. Adventure unfolds all around your island! *Sometime it change to 0 but you can still use it. Overview: Monsters are gathering now. A bolt of arrows! Colorful magic! Powerful Explosion! Time of battle is back.